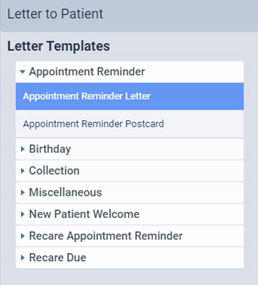 You can quickly create a custom letter or postcard for an individual patient. The letter or postcard can contain patient and practice information that has been merged into a letter template. On the Patient menu, under General, click (or tap) Letter to Patient. The Letter to Patient dialog box appears. The options to edit the letter become available. Change the content and layout of the letter template, and format the text as needed. Also, you can insert a merge field (such as Patient First Name, Patient Address, Account Balance, and Appointment Time) at the location of the text cursor anywhere in the message. You cannot save any changes that you make to the template. If you want to change the template permanently, you can do so from the Letters page. 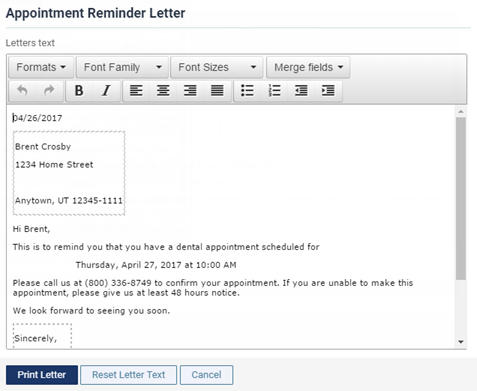 A merge field appears in the template as text enclosed in square brackets (for example, [Patient_First_Name]), but the message that a patient sees will have the relevant information from your practice database inserted in place of the merge field (for example, [Practice Address] will be replaced with the practice address of a patient's preferred location). Tip: If you need to reset the entire content of the letter template back to its original text, click (or tap) Reset Letter Text. Click (or tap) Print Letter. A .pdf copy of the letter (merged with the applicable patient and/or practice information) appears on a new browser tab. Appointment reminder letter or postcard - If the patient does not have a future appointment, visit information cannot be merged. Collection letter - If the patient does not have an aged balance that corresponds to the aging range of the letter, an account balance cannot be merged. Treatment plan letter - If the patient does not have insurance coverage, insurance information cannot be merged. If the patient does not have a treatment plan, treatment plan information cannot be merged. New patient welcome letter or postcard (before visit) - If the patient does not have a future appointment, visit information cannot be merged. New patient welcome letter or postcard (after visit) - If the patient does not have a past appointment, visit information cannot be merged. Recare due letter or postcard - If the patient does not have a future recare appointment, visit information cannot be merged.